I finished my mystery WIP and I couldn’t be happier with the outcome. 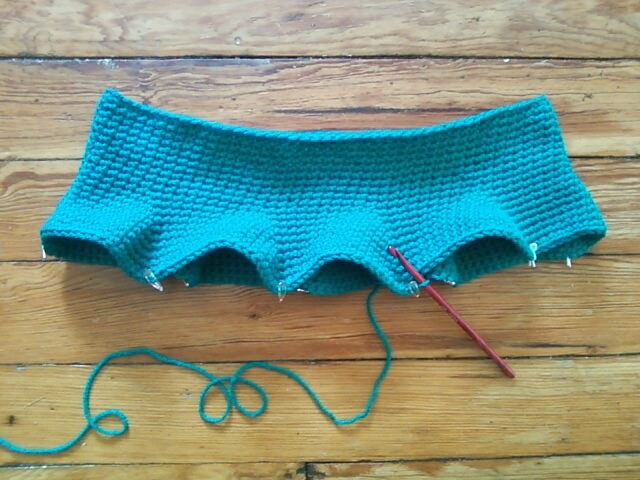 I did at one point tear out about 20 rows because I wasn’t happy with the way it was working up. And I’m so glad I did. Because it completely changed the look and vibe of it. My crochet style is consistent with my personality; resourceful, free-spirited, and innovative. For this project, I wanted to capture a few trends of this season. Bold colors with hints of neon, short hem with a natural waist, feminine with an edge. I’m calling it the Skater Skirt. And while I don’t have a “pattern” per se, I do have an outline that you can use to recreate your own. I know I’m ready to make one in every color now! 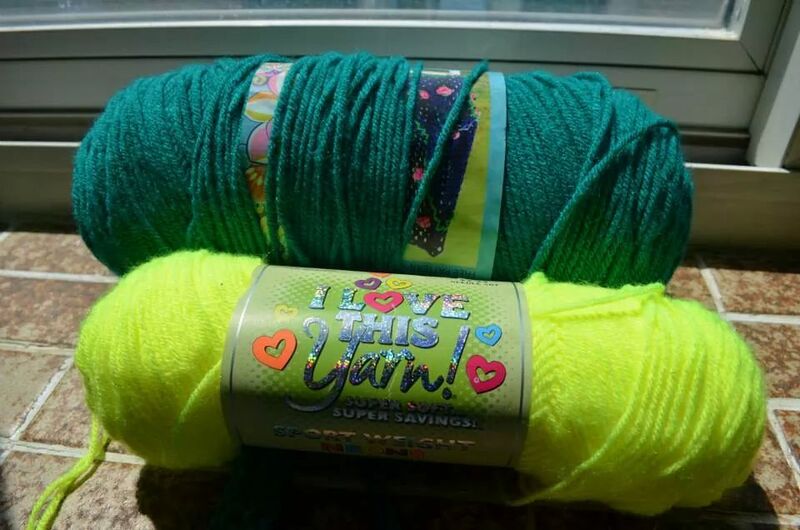 I used almost all 355 yards of the teal and only a little of the accent neon yellow color. Getting started, with my main color I made a chain that was long enough to fit around my waist and leave enough room to stretch over my hips. For me that was 90 chains using a 6 mm hook (the yarn gauge calls for a 5.5 mm, but sometimes I go up a hook size to keep my stitches stretchier.) It is helpful to start with a multiple of 10 if you can, this will make your increases easier to keep track of. Slip stitch to the first chain to create a circle. You will be working in the round. I used single crochet for my first 12 rounds to create the waistband. I switched up my stitch after the waistband to get a thinner, more stretchy fabric. So for the remainder of the skirt, I used extended single crochets (ESC). This is my first project using ESC and I am hooked. I love how it works up. So, you have 12 rows of sc. Work 3 rows of ESC. Now we’ll start increases. Here’s how I worked mine in. Since I started with 90 stitches per round, I decided to add 10 stitches evenly distributed throughout my first increase round. So every 9th stitch I worked 2 ESC. By the end of this round I had 100 stitches. To keep the increases gradual, I worked 2 more rounds of 100 stitches. (So 3 rounds of 100). I repeated this process throughout. So my next increase round I added 10 more stitches by working 2 ESC into every 10th stitch (110 stitches). Then work 2 more rounds of 110 stitches. I did this 5 more times until it was a length I was happy with. For me, my final three rounds were 160 stitches. This is just a simple guideline to help you make this project your own. 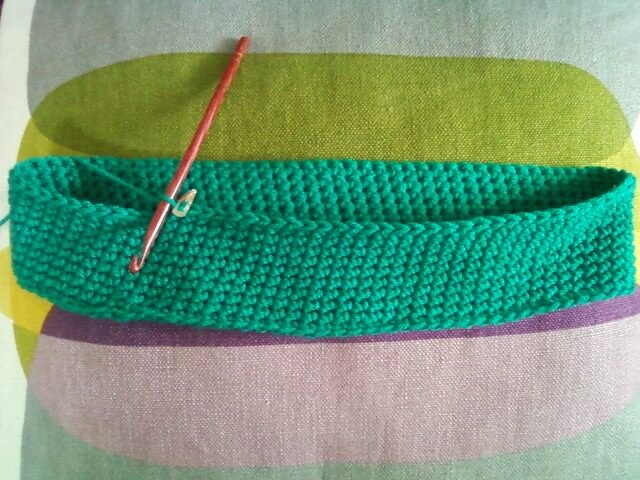 I found that adding 10 stitches every three rounds made for a really nice a-line shape which is exactly what I was going for. But don’t be afraid to experiment with that formula to make it to your preferences. That’s the beauty of free-form crochet. It can be easily adapted. For the hem detail with my accent color, I could have done any edging. I actually made mine up as I went along. It turned into a cool asymmetric scalloped edge. Just keep in mind the number of stitches you end on and find a repeating pattern you like that divides it evenly. Or you could simply add an extra 3-6 round with increases for a color blocking effect. So here it is! If you have any questions or issues please leave a comment. I look forward to seeing how you use this guideline and make it your own. Please share finished pictures too!